The newest addition to our anti-slip solutions for industrial footwear is the K1 Series Mid-Sole, a one-size-fits-all, convenient solution for adding traction in icy and snowy work conditions. 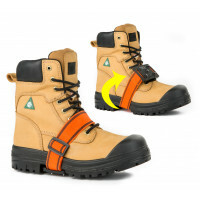 Proven to prevent slips and falls on the job, the K1 Series Mid-Sole not only prevents heel slips but also provides traction for the sole of the foot in all conditions. This innovative design is in high-demand across all industries with workers regularly going from outdoor to indoor environments. Copyright © 2019. Eric Cox Sanitation.